Right now, under the Mandatory Rental Relocation Assistance Law, most landlords with more than one rental property are required to pay between $2,900 and $4,500 in fees to a tenant whom they've evicted without cause or whose rent they've raised by more than 10 percent. Landlords and tenants faced off at Portland City Hall on Wednesday surrounding a vote expected to solidify an ordinance that requires landlords to pay for the moving costs of some tenants. Right now, under the Mandatory Rental Relocation Assistance Law, most landlords with more than one rental property are required to pay between $2,900 and $4,500 in fees to a tenant whom they’ve evicted without cause or whose rent they’ve raised by more than 10 percent. The policy was first introduced on a temporary basis in February 2017 and expires on April 6. A permanent policy was expected to be voted on Wednesday but due to extended public testimony, the vote was postponed. Without further amendment, the permanent policy would remove a key loophole that exempts single-dwelling landlords from having to pay those fees. 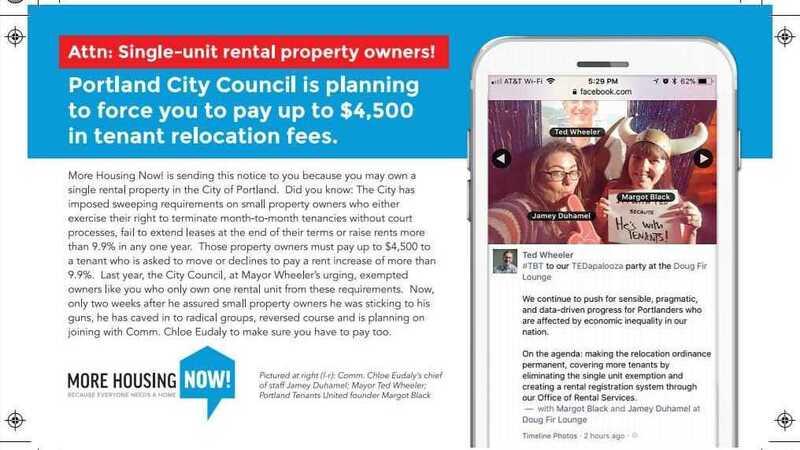 While the permanent policy, proposed by Mayor Ted Wheeler, would require property owners who rent out a single unit to make these payments as well, it also creates new loopholes. For instance, landlords who rent out their own, primary homes for three years or less and those actively serving in the military would now be exempt. On the other side of the debate, groups advocating for property owners rounded up representatives to pack council chambers and speak against the mayor’s proposal. A spokesman for More Housing Now! said Wednesday they sent out 9,000 copies of a mailer to single-dwelling landlords saying the mayor “caved in to radical groups” in his push to remove their exemption. The mailer called for members to call and email the mayor’s office or just show up at Wednesday's meeting.